These cuties do, that's HOO! 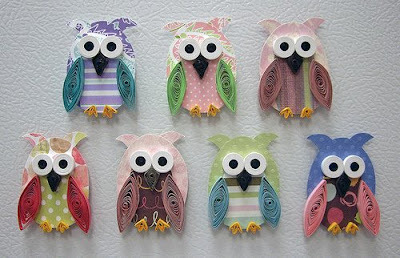 This project started out as one owl magnet for my sister and before I knew it I had 7. I love them, and they're so addictive to make. I've made 2 more since this batch, I'll keep posting them in batches as I go. I've been busy. We just finished our third week of our Papertwirlies Team blog contest; we didn't get that many comments; I don't know why; our prizes were great - maybe it was just too much work to go and look at all the shops and leave a comment; although people could have cheated and just left one item and shop we wouldn't have minded. I have also re-designed my other etsy shop, pinkmonkeygraphics; I'm a graphic designer and my goal is to once again work for myself and friends have told me I should open a shop for that too. I must admit I don't have enough time so I'm not rushing into that shop quite yet. I have to decide what design services to offer and stuff like that. I made a new banner and avatar and if I do say so myself they're too cute. I may just start out with banner and avatar designs, that I can handle. 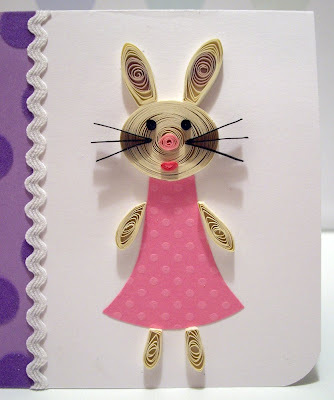 With Easter right around the corner, I'm putting my bouncing bunny time section on sale - cute stuff, cards; mini bunny frame and lovely egg ornaments all handmade and quilled by myself. This past week I received two convo's from two different women for custom orders, it's strange how that works. One was immediate, I worked on it last night and this morning and just shipped it out. 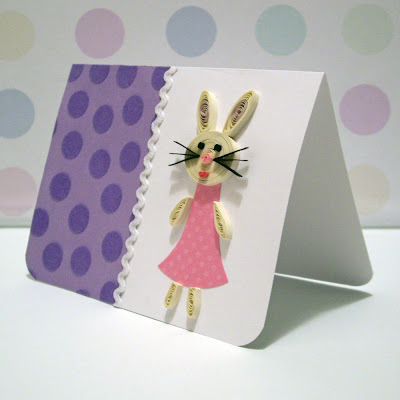 The other is for 25 birth announcement cards, based on the poppy and ladybug card I have for sale. Not sure if the cards are a done deal, waiting to hear back. 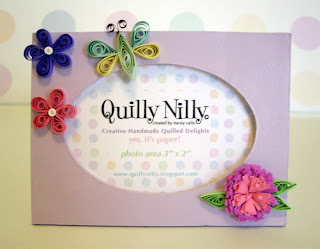 The frame custom order is for a 1st birthday party, they will be used as favors; 8 of the mini frames. She asked that I cover 4 of the frame in a pretty lavender tone on tone dot embossed paper and the other 4 paint a cool light purple. This was the first time I had covered the mini frames with paper and they turned out really nice, I'm going to definitely try it again in the future. I then created 3 flowers and 1 butterfly for each of the 8 frames. Unfortunately my fringer decided last night it was going to stop working so I had to hand cut the fringes; but they turned out great. I loved my fringer but if they can't fix it or explain to me how to; I'm not going to by another one; I don't fringe that many flowers to justify buying another one; not at this point. Now I think I'm going to work on photo holders, my sister suggested I do some with owl's - good idea. I'll post when they're done. Alright everyone out there, there is still time to enter the Papertwirlies Team Blog Giveaway; two great gifts are being given away this week to one lucky winner. This weeks contest ends this evening, and next week's will start up on Tuesday. 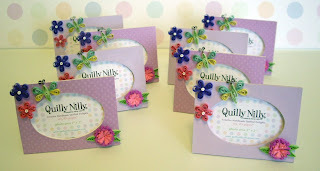 If you'd like to win a very nice bookmark and fun card by Quilly Nilly (me) then please visit our team blog and enter - really it's super easy. Good luck! It's been weeks since I posted anything, I was sick with sinus issues and it's taken me awhile to get caught up with everything but I think I'm almost there. 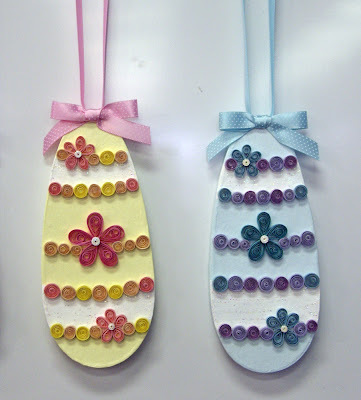 Weeks back I was browsing through Michael's and came across these paper maché egg shapes and knew I had to have them and how perfect they would be for easter. Well it's taken probably 3 weeks to finish them all but I'm so happy with how they turned out. 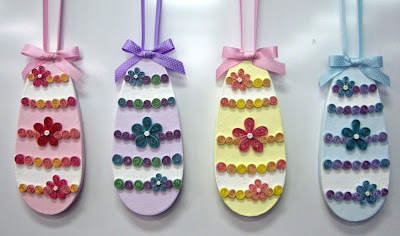 I painted them each a different color - lavender, pink, blue and yellow; then added two white stripes to each egg shape which I then painted with clear glitter. 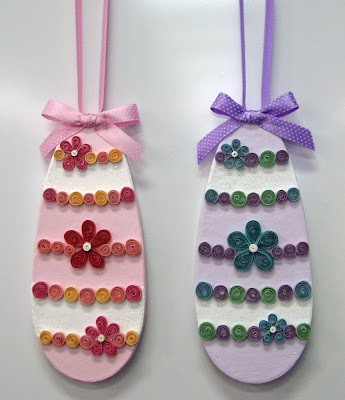 I quilled circles and flowers in coordinating colors to go on each egg, added polka dot ribbon and finally I finished. I have put two in the shop here in town and two will be going into my etsy shop.